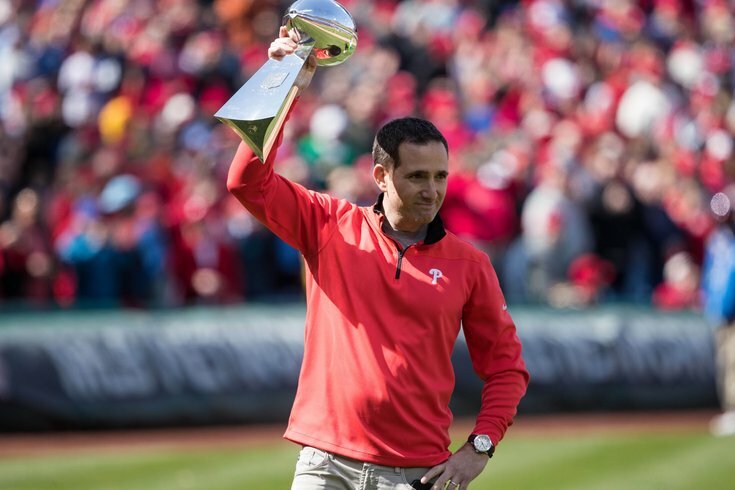 Philadelphia Eagles general manager Howie Roseman shows off the Lombardi Trophy before a Phillies game. Since the start of the Andy Reid era in 1999, the Philadelphia Eagles have traded out of the first round just twice. The players they ultimately ended up with in the second round as a result of those trades were Kevin Kolb and Trevor Laws. Those uninspiring selections notwithstanding, the 2018 NFL Draft feels like a logical year for the Birds to trade out of the first round. In an interview session on Thursday, Howie Roseman said that the No. 32 pick is for sale. "I would say overall we're open for business," said Roseman. "We're open for business in every round if it's something that we think makes sense for our team, we're going to do it. But at the same time, we're ready to pick. We have 32 guys we feel really good about. We can't operate under the assumption that we're going to bail out, so we're ready to roll." McDougle: The only bust of the trade-up group, largely because he got shot. Maclin: Developed into a very good starting receiver, had 1300+ receiving yards the year before bolted for Kansas City in free agency. Graham: Highly criticized pick for years, but Graham is now one of the best players on the team, and a Super Bowl hero. Wentz: NFL MVP until he tore his ACL. Agholor: Bust for two years who broke out in year three with the team. Barnett: Looks like a long-time NFL starter who made a difference in his rookie season. A season ago, the Eagles were sitting at pick No. 14, where they felt confident that they were going to get a very good player. "When we look back and we look at our drafts, specifically looking at where we were in the 20's, we've had some good success at 20 and higher," said Howie Roseman, speaking at the 2017 Senior Bowl. "I think there is a line where you don't get a difference maker. This is your opportunity, in the first round of the draft, to find a difference-making player. That's our first priority, is bringing in a difference maker to the Philadelphia Eagles. In order for the Eagles to get into a spot on draft day where they think the "difference makers" can be had, they would have to trade up into the teens. Unfortunately for them, the Eagles don't have the ammo to do that, at least in terms of draft picks, seeing as they have no picks in rounds 2 or 3. In order to move up into that philosophical "20-or-better" range, the only real ammo the Eagles have, without parting with a future No. 1 pick, would be Nick Foles. Beyond a trade of Foles prior to the draft, an unlikelihood at this point, moving up into Roseman's preferred draft territory is doubtful. As for staying put or moving back, there's a thinking that there isn't much of a difference between picking at 32nd overall (obviously an amazing problem to have) and a few spots later. Joe Douglas did note that the Eagles would be more than ready to make a pick at 32 when they are on the clock. "When you're pick, any number you're picking, whether it's 14 last year, or it's 32, you have to have 32 guys you're excited to take," he said. "Right now we have 32 guys we'd be fired up to get." "When you look at the numbers based on what the option year is projected to be, there are some incredible values by having the fifth year of the deal, and I think that's why you see teams that are jumping from the second to the first round, because everyone is aware of those discussions," Roseman explained. • Green Bay traded their first-round selection (29th) to Cleveland in exchange for Cleveland's second- and fourth-round selections (33rd and 108th). • Seattle traded a first-round selection (31st) to San Francisco in exchange for San Francisco's second- and fourth-round selections (34th and 111th). • Seattle traded a second-round selection (34th) to Jacksonville in exchange for Jacksonville's second- and sixth-round selections (35th and 187th). • Chicago traded their second- and seventh-round selections (36th and 221st) to Arizona in exchange for Arizona's second-, fourth-, and sixth-round selections (45th, 119th, and 197th) as well as a fourth-round selection in 2018. • Kansas City traded its first-round selection (28th) and seventh-round selection (249th) to San Francisco in exchange for San Francisco's second-, fourth-, and sixth-round selections (37th, 105th, and 178th). • Tennessee traded its second-round selection (33rd) to the Giants in exchange for New York's 2015 second-, fourth- and seventh-round selections (40th, 108th and 245th). • Seattle traded its first-round selection (32nd) to Minnesota in exchange for Minnesota's second- and fourth-round selections (40th and 108th). • Washington traded its second-round selection (34th) to Dallas in exchange for Dallas' second- and third-round selections (47th and 78th). • New England traded their first-round selection (29th) to Minnesota in exchange for Minnesota's 2013 second-, third-, fourth-, and seventh-round selections (52nd, 83rd, 102nd, and 229th). Because the Eagles are already so tight up against the salary cap with a Carson Wentz mega-contract extension looming in the semi-near future, the Eagles can use all the inexpensive players they can get. You obtain those guys in the draft, so this may be a reasonable year for the Birds to trade back and acquire some extra picks. Then again, if there's a player sitting there at 32 that the team loves, as always, they should probably just take him.